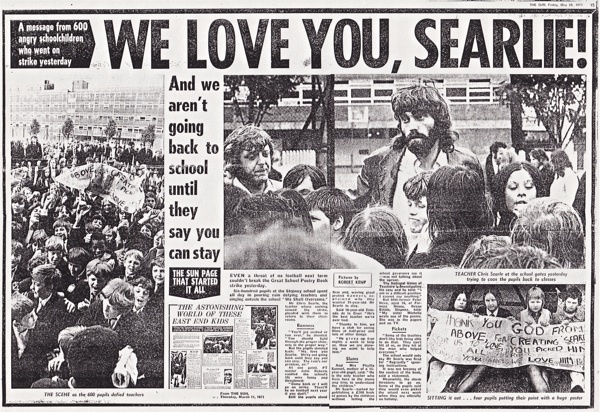 In the summer of 1971, eight hundred pupils went on strike in Stepney, demanding that their teacher, Chris Searle, be reinstated after the school fired him for publishing a book of their poetry. At a time of unrest, following strikes by postmen and dustmen, the children’s strike became national headline news and they received universal support in the press for their protest. 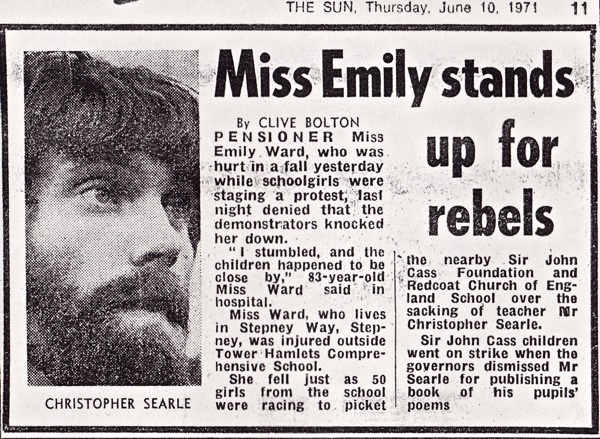 More than two years later, after the parents, the Inner London Education Authority, the National Union of Teachers, and even Margaret Thatcher, then Education Secretary, came out in favour of Chris Searle, he got his job back and the children were vindicated. And the book of verse, entitled “Stepney Words” sold more than fifteen thousand copies, with the poems published in newspapers, and broadcast on television and read at the Albert Hall. It was an inspirational moment that revealed the liberating power of poetry as a profound expression of the truth of human experience. 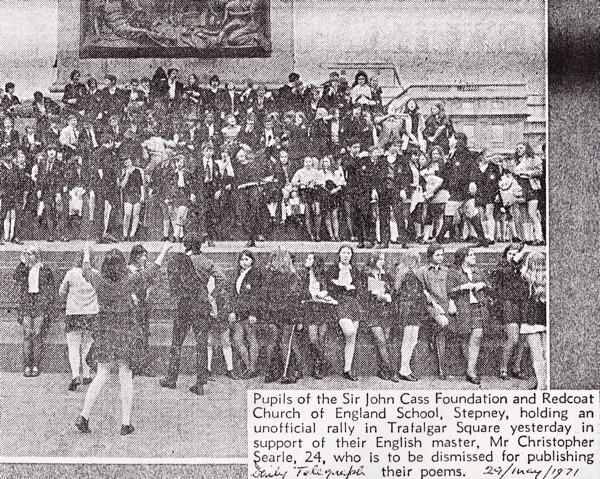 Many of those school children – in their fifties now – still recall the event with great affection as a formative moment that changed their lives forever, and so when Chris Searle, the twenty-four-year-old student teacher of 1971 returned to the East End to recall that cathartic Summer and meet some of his former pupils, it was an understandably emotional occasion. And I was lucky enough to be there to hear what he had to say. I grew up in the fifties and sixties, failed the eleven plus and I hated any kind of divisiveness in education, I saw hundreds of my mates just pushed out into menial jobs. So I got into a Libertarian frame of mind and became involved in Socialist politics. I was in the Caribbean at the time of the Black Power uprisings, so I had some fairly strong ideas about power and education. Sir John Cass Foundation & Redcoat School in Stepney was grim. It was a so-called Christian School and many of the teachers were priests, yet I remember one used to walk round with a cape and cane like something out of Dickens. The ways of the school contrasted harshly with the vitality and verve of the students. As drama teacher, I used to do play readings but I found they responded better to poetry, and I was reading William Blake and Isaac Rosenberg to them, both London poets who took inspiration from the streets. 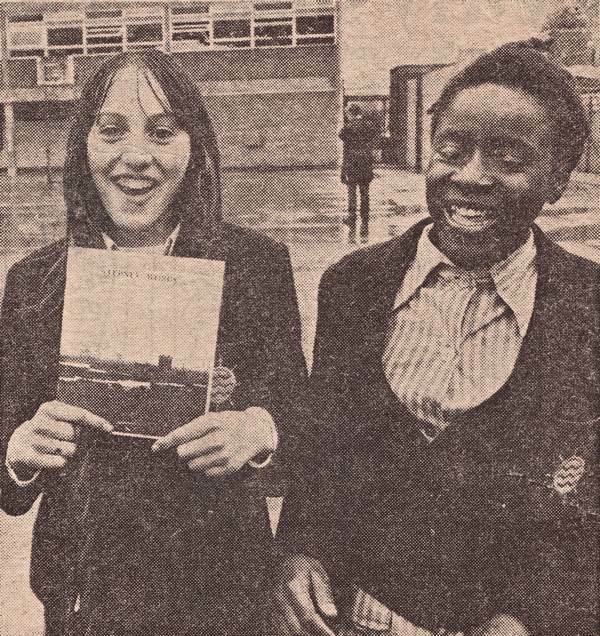 So I took the pupils out onto the street and asked them to write about what they saw, and the poems these eleven-year-olds wrote were so beautiful, I was stunned and I thought they should be published. Blake and Rosenberg were published, why not these young writers? We asked the school governors but they said the poems were too gloomy, so they forbade us to publish them. I showed the poems to Trevor Huddleston, the Bishop of Stepney, and he loved them. And it became evident that there was a duality in the church, because the chairman of the school governors who was a priest said to me, ‘“Don’t you realise these are fallen children?” in other words, they were of the devil. But Trevor Huddleston read the poems and then, with a profound look, said, “These children are the children of God.” So I should have realised there was going to be a bit of a battle. There was even a suggestion that I had written the poems myself, but though I am a poet, I could not have written anything as powerful as these children had done. Once it was published, the sequence of events was swift, I was suspended and eight hundred children went on strike the next day, standing outside in the rain and refusing to go inside the school. 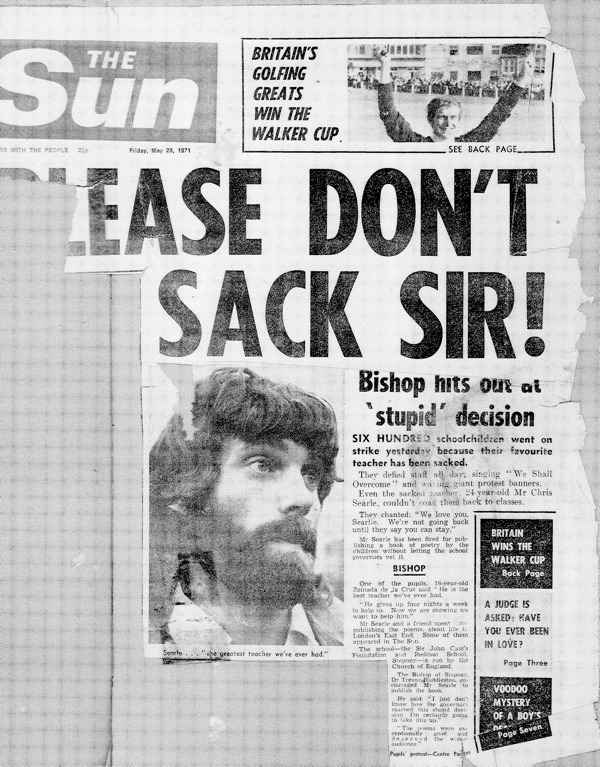 I didn’t know they were going to go on strike, but the day before they were very secretive and I realised something was up, though I didn’t know what it was. I didn’t have an easy time as a teacher, it was sometimes difficult to get their interest, and I had bad days and I had good days, and sometimes I had wonderful days. Looking back, it was the energy, and vitality, and extraordinary sense of humour of the children that got you through the day. And if, as a teacher, you could set these kids free, then you really did begin to enjoy the days. It gave me the impetus to remain a teacher for the rest of my life. I tried to get the kids to go back into the school. During the two years Chris was waiting to be reinstated at the school, he founded a group of writers in the basement of St George’s Town Hall in Cable St. Students who had their work published in “Stepney Words” were able to continue their writing there, thinking of themselves as writers now rather than pupils. 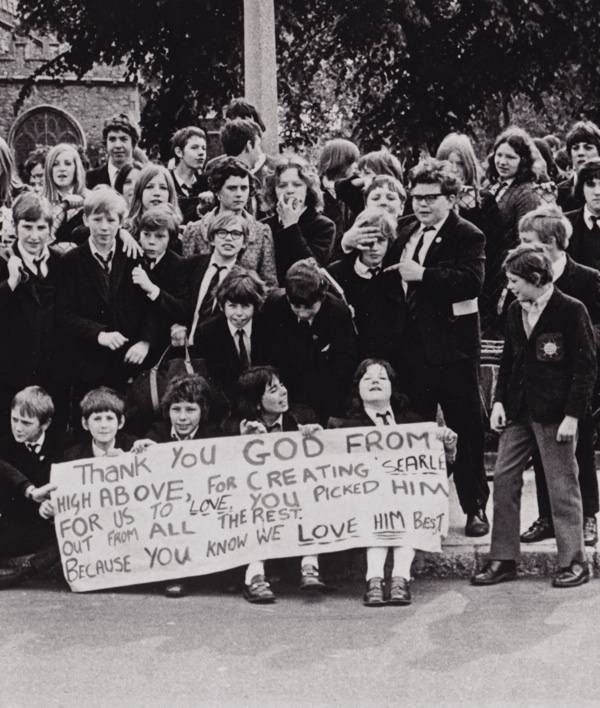 People of different ages came to join them, especially pensioners, and they used the money from “Stepney Words” to publish other works, beginning with the poetry of Stephen Hicks, the boxer poet, who lived near the school and had been befriended by many of children. 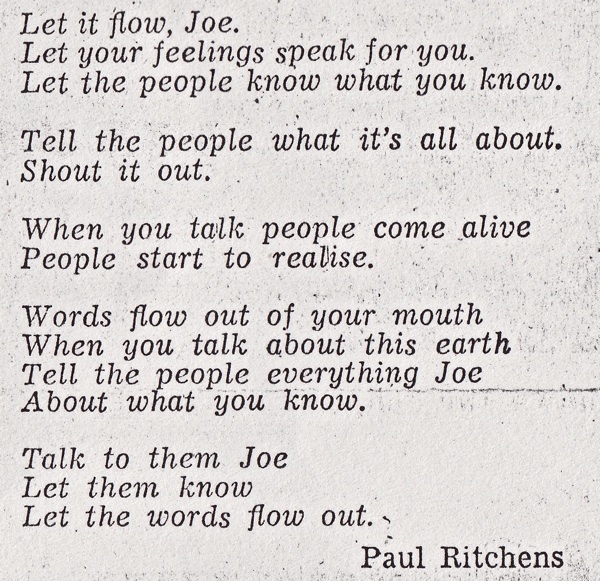 Returning to the East End four decades after the school strike, teacher Chris Searle reads one of the original poems from Stepney Words,”Let it Flow, Joe”, with some of his former pupils. What a great post. I’ve just email’d the link to my daughter who is a teacher. She was recently reading poetry that her pupils had written. It would be wonderful if teachers were able to encourage students in such a pro-active & creative way these days. An inspiring teacher can positively influence a person’s life. What a lovely person. What a fantastic and inspiring article! Brilliant. Thanks for this inspirational piece, which reminds us how much one teacher can do. It also reminds us that students can be militant, can take action. These days teachers face different barriers. Every child matters but there is little time for free expression with targets to meet and prescribed curriculum to get through. A heart warming story. I think that is what yo do, GA, ‘tell the people what you know’ about the life of The East End and what it might mean to be human; about injustice and self expression. This post sums it up, really. Some of us are still here, still writing and even organised this event. It’s proving very popular but although sold out the library says they’ll try and fit everyone in anyway. So bing a cushion and drop by! 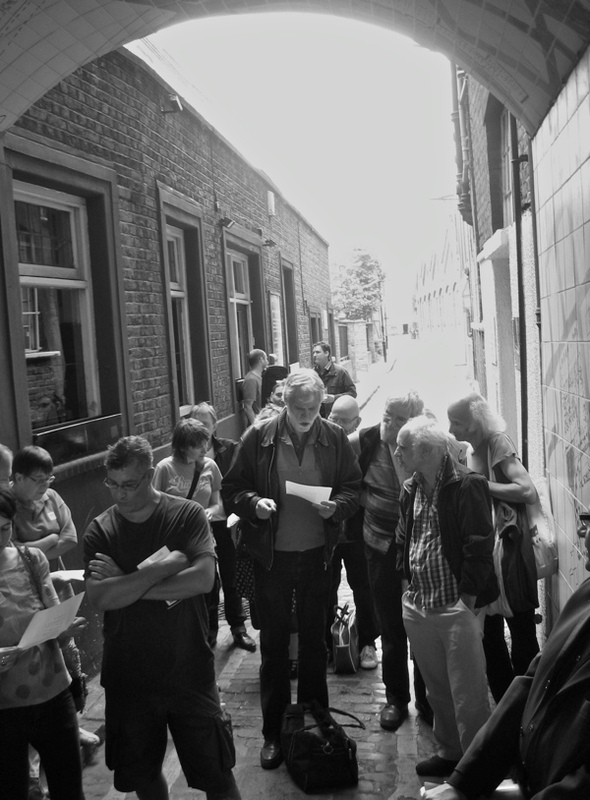 We’ll also be looking at the work of the Basement Writers (what Chris did next) – a community writers workshop based in Cable Street that helped many local people of all ages to find a voice and get into print. It and the strike changed lives. To reflect and continue this work it is hoped that next year (the now retired) Chris may return to the East End and collaborate with local children to harvest a second crop of Stepney Words. What a great story! An inspirational teacher and amazing children. I agree, a truly inspiring post. I am busy at the moment researching a member of my family, Frederick Greenwood, the editor of the Cornhill, the Pall Mall Gazette and the St James’ Gazette in the 19th century, and he had no time for hypocrisy of the sort shown here by Chris Searle’s employers. I have no doubt what he would have said about the role played by some church men here. Disgraceful!! I remember this well. I took up my first teaching post in a rough school in Oldham at about the same time and it was a similar battle to get kids to realise their worth, often in the teeth of incredible inertia and obstructiveness of senior staff. It was great news when he was vindicated. Great Teacher,Great School,Sir John would have been proud of him,first i have heard about this. Ian Silverton ex pupil.